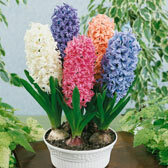 Hyacinth are a highly fragrant spring flowering bulb that are available in a wide range of colours and suitable for growing in pots, borders or even rockeries. 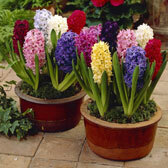 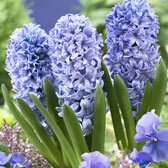 Fragrant Hyacinth bulbs produce spiky shaped flowers that really do make an impact, especially when grown in groups. 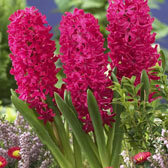 You can choose from specially prepared indoor flowering bulbs (which are treated to force flowering early in winter), top size 17/18cm bulbs (if you want the largest blooms possible outdoors) or the very popular bedding size 14/15cm bulbs (which are great for mass planting in borders).